Fundamental Wines is a project that winemaker Joey Tensley and wife, Jennifer Tensley, have been talking about for some time. As owners of the highly-rated Tensley Wines label, the couple has spent the last 15 years traveling to wine regions around the world. During their travels they were consistently impressed not only by the higher end wines they tasted but also by the many quality value wines they came across. They decided to make a great quality value wine of their own. One that would be priced to enjoy every day. One that would sustain the quality and style the original Tensley brand has maintained for twenty years. One they would be proud to put their name on. 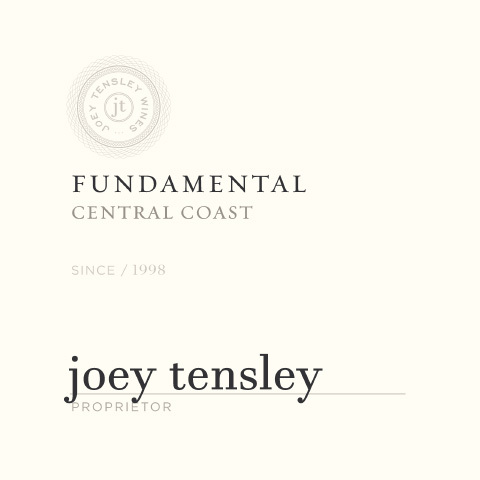 They chose “Fundamental Wines” as the name for the new brand of Joey Tensley signature wines. They felt it perfectly described the philosophy of the brand – make fundamentally sound, straightforward wines that over-deliver for the price on every level: quality, packaging and every day availability. Vintage Wine Estates has come on board with Joey and Jennifer in bringing this dream to fruition. Joey Tensley started his original brand, Tensley Wines, in 1998, and has steadily and impressively grown both the brand and his reputation since then. Tensley, which started with a 100 case production, now produces 5,000 cases a year and receives top scores from critics across the board. Food and Wine has named the Tensley Colson Canyon Syrah, “Best Syrah in America;” Robert Parker has given a Tensley Syrah 99 points, and the Colson Canyon Syrah has twice been named one of Wine Spectator’s Top 100 Wines in the World. At $18 per bottles these wines truly are living up to their promise to over-deliver on quality for the price.